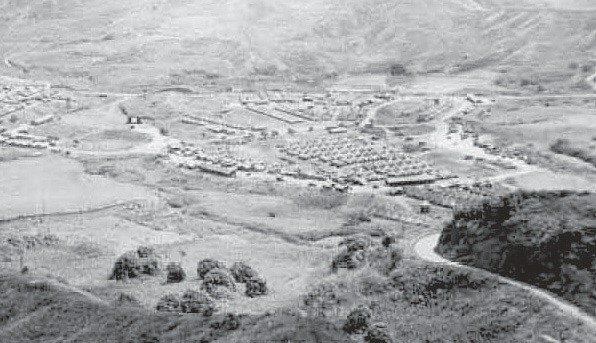 In 1943, the Army established a regimental combat team training center at the foot of the Pali, emphasizing the use of and familiarity with modern arms and field weapons. In addition, the camp provided rugged terrain for jungle and Ranger training. The training area comprised of four non-contiguous parcels: Maunawili Valley Impact Area, covering approximately 3,450-acres; the Maunawili site (near St Stephens Seminary,) 400-acres; a 46-acre site on the northern ridge of Mount Olomana; and the 500-acre site called Ulumawao. The Pali Training Camp was situated in what is now the municipal Pali Golf Course, privately owned Ko’olau Golf Course and Hawaii Pacific University.